Whenever you are communicating the spoken word is usually the most crucial means of conveying your message. While many of our sound systems are designed for the reproduction of both speech and music (either live or recorded), at APi Communications we pay particular attention to vocal clarity. We recognise the importance of the higher frequencies in speech intelligibility, especially for those whose hearing is not as good as it once was, but are well away from needing a hearing aid for day to day life. We have all been at events where the volume was sufficient but what was lacking was the detail. Your system from APi Communications will have fine control of the system designed in to match the acoustic properties of the space. Of course the system components have to be visually appropriate to blend in with their surroundings. You will never see a large black or even white box loudspeaker in your installation as APi always choose the most discreet loudspeaker units for their location, frequently colour matched to the wall on which they will be placed. The key to a successful system is how well the point of control i.e mixing desk suits the abilities of all the intended users and the task it is expected to perform. With a large range of tried and tested options we are sure we can find your perfect match. See also our page on ‘Why a Digital Mixer’. Of course no sound system is complete without microphones, a good choice of these can be the key to feedback free sound. We carefully select from a range of tried and tested models appropriate to your project. Wireless microphones usually come with hidden battery costs, so our rechargeable range are worth paying a little extra for, as a 2 set system will save you around £24 per year, you won’t need to keep spares and they will never run down during a service. We frequently enclose the equipment within a rack cabinet as this provides a measure of security and increased reliability by fixing things in place. A wide choice of cabinet finishes are available to suit the surroundings. There are many aspects to consider when a sound reinforcement system is being designed and APi Communications have extensive experience to put at your disposal. Because we are not trying to push a specific manufacturer we can make an informed decision on offering you the best solution for your requirements. For more information about installing a sound system the Church of England have put together a checklist, which you may find useful. Click here to see their factsheet. 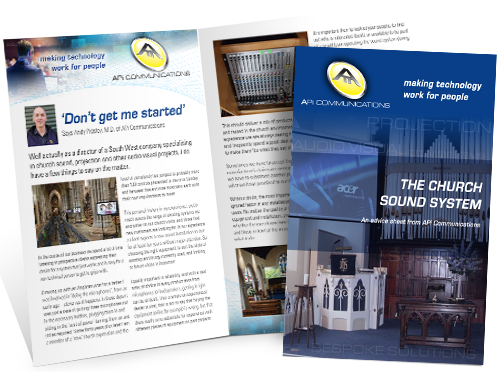 Stephen Carter (ex BBC) of Seraph Media has also written an excellent summary of the issues faced by churches with sound reinforcement. Click here to read his article. We couldn’t agree more with his findings and they echo our usual recommendations. Contact us today on 01392 677668 or get in touch online for a no obligation quote.